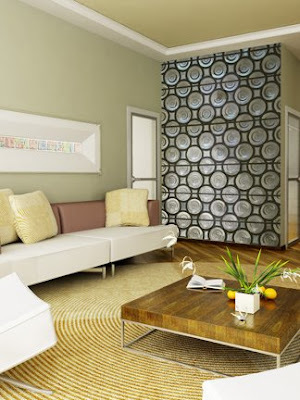 The custom wallpaper image we're featuring today is a very unique window, comprised of numerous round glass sections held in place by an iron frame, similar in nature to stained glass. Wall murals that emulate the look of windows have a very similar effect as real windows, they add a lightness and sense of openness to a room. Whereas this custom wall mural is more modern, a faux glass or trompe l'oeil window mural can also be very literal. If you have a room with no windows, adding a smaller mural that looks just like the real thing overlooking a beautiful outdoor scene can be even more effective than an actual window. What's more, since this is custom wallpaper, you have complete control in what the scene will look like out of the window. Your window mural may feature a lush tropical garden, or a tranquil forest; it's up to you. Like other architectural elements, a faux glass mural helps to add visual interest to a room in a very grounded, structural way. Contact us to discuss more custom wallpaper options.